Each week, we set aside one night that is our family night. We call this Family Home Evening. This year, we have started a new tradition. The first week of the month, we are doing private interviews during our family home evening. One by one, my husband takes each child, including Brinley (age 2), into a room in our home and conducts an interview with the child. During each interview, I play a game with the other three children. 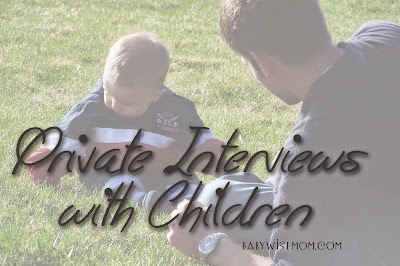 A private interview is a great time to encourage children. It gives the parent an opportunity to ask questions and to share testimony. I want my children to know that we will be regularly asking questions of them. I want them to know that at some point, they will be asked about a variety of pointed topics that they will need to answer. I figure starting at the younger ages will mean that when they are older and I really want these interviews happening, the interviews will just be a part of life. So far, my children all love it. It can really be either parent. My husband does the interviews for two reasons. One is that I feel like I talk to the children regularly already. This is an opportunity for him to stay in touch with what is going on in life and to also develop a special bond with them. Another reason is he is the head of our household. Now, I am all for strong women and girl power and all that. Being the head doesn’t mean he is the final word (or only word); it is serving as Christ served and serves. It is loving and protecting and providing. These interviews definitely do not need to be done by the father; it can be the mother instead. You could take turns. For us, we do father. My husband does everyone from Brayden, our oldest age 9, on down to Brinley, our youngest age 2. Brinley’s are short :). Even if your child can’t talk, you can take the child into the room and share your thoughts and feelings about the child and say a prayer with the child. What is talked about in an interview? I think it is wise to include prayer in the interview. They start with a prayer and end with a prayer. My husband says one prayer and the child says the other. The child should be able to talk about any topic. Any subject, problem, experience, or concern should be freely spoken of. It is important to take these concerns seriously. Do not brush them off or tell them their concerns seem big now but someday they will be small. As humans, we learn line upon line. Many of our own concerns now as adults will seem small in retrospect. That doesn’t mean they are small now, and the same is true for your children. If you dismiss their concerns, they will have less reason to share their concerns. You can ask about how relationships are going. How are sibling relationships? Friends? Teachers? Peers? To prompt them to talk, my husband asks questions about what they are involved in. He asks how school is and who they play with at recess. This can lead to other questions coming up naturally. He asks about each activity they are involved in. My husband always shares things he appreciates about the child. He shares how he feels about them and things they are good at.